Retired Staff Sgt. Jesse Whitmier exercises in the NASA-developed "anti-gravity" treadmill that allows him to control the amount of his body used during the workout. The U.S. military is testing a NASA-developed "anti-gravity" treadmill to help veterans with physical therapy treatment after surgery. The Palo Alto Veterans Affairs Medical Center in Palo Alto, Calif. is testing a prototype AlterG anti-gravity treadmill in their outpatient physical therapy gym. The machine employs differential air pressure technology to alter the body's weight, making users feel as if they are "walking on the moon." "Most of my patients use it," said Lemmer Bustamante, a physical therapist at the Palo Alto VA Medical Center. "If we didn't have the AlterG, it would be hard for my patients to use treadmills after operations on their knees or hips." Patients can zip themselves in to the treadmill's pouch, which uses air to effectively "lift" the body, reducing the normal amount of pressure and weight at critical joints. The treadmill was designed to help alleviate pressure on runners' hips and knees. "The AlterG treadmill allows me to do things I can't naturally do anymore," said Jesse Whitmier, a retired staff sergeant who is recovering from a recent surgical procedure. "I can continue to run like I did when I did track-and-field and even keep my weight down without pain in my knees." Whitmier said that when he's in the treadmill, it feels like what he would expect being in a NASA laboratory with astronauts training for spaceflight might be like. The machine's touch-screen interface not only allows the therapist or patient to control the speed of the treadmill, but can also be used to adjust the distribution of body weight to maintain a comfortable workout. The ability to control these settings enables therapists to modify the functions of the treadmill over time, in accordance to a patient's treatment plan. Bustamante reported seeing much faster progress in his patients after using the anti-gravity treadmill. "Previously, we used a pool treadmill, but the problem is you can't control the weight bearing," Bustamante said. 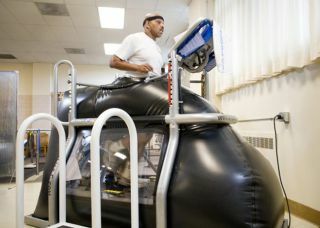 The AlterG treadmill is the first FDA-cleared medical device of its kind, and has been in use at the Palo Alto VA Medical Center for seven months. The prototype was developed by the Palo Alto Rehabilitation Research and Development Center in collaboration with NASA and AlterG, a privately held medical device company based in Menlo Park, Calif. Similar devices are also used by other major medical centers, leading physical therapy clinics and professional, collegiate and individual sports and fitness programs.